Whether your goal is to get in shape or compete, our Muay Thai Kickboxing classes will help you achieve it. Designed for men and women of all experience levels, these classes will ramp up your cardio, build full-body endurance, and develop your skills in this dynamic martial art. The national sport of Thailand, Muay Thai is a style of kickboxing that uses the fists, elbows, shins, and knees, as well as a small amount of stand-up grappling, to engage an opponent. Students of all ages, sizes, and ability levels will feel comfortable here. We’ll pair you up with the perfect partner for your introduction to Muay Thai—all you need is a shirt, shorts, and water bottle! 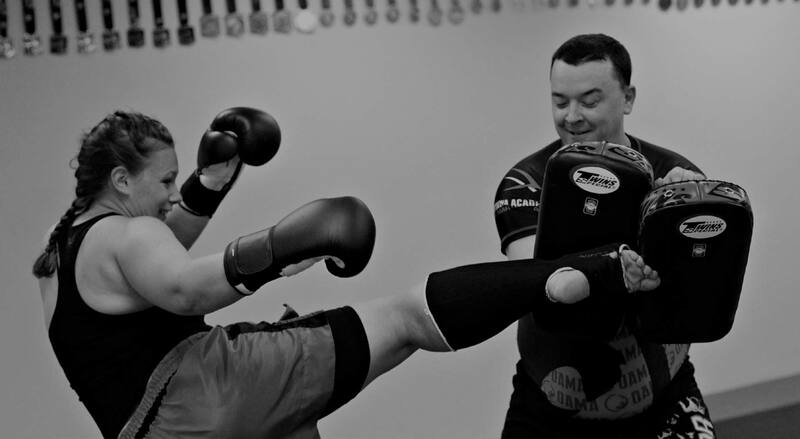 All of our classes are taught by professionally trained Muay Thai instructors to ensure a safe and enjoyable training environment. Multiple times a year, we offer our members in-depth Muay Thai seminars taught by some of the best in the world, including former UFC champions, right here in North Bay. Perfect for students looking for more one-on-one instruction, whether they have an competiton coming up or just want to stop getting caught with the same move! Call us today to book.